The American breakthrough at Avranches on 4th August threatened the three northern Biscay bases with encirclement, and steps had therefore to be taken to evacuate the U-boats in good time. The primary requirement was to complete those boats currently fitting out with schnorkel at Brest, Lorient and St Nazaire, while those for whom there was no gear available in these bases were made ready for sea and sailed for La Pallice or Bordeaux, the opportunity being taken also to transfer experienced dockyard and specialist personnel, together with essential material such as schnorkel components, T5 torpedo testing gear and non-ferrous metals. The U-boat personnel remained in the three northen bases, above all those whose boats were undergoing extensive refits and could not complete in the near future, were, as far as the land battle permitted, returned to Germany. Subsequent to the enemy breakout, the situation deteriorated rapidly and our scanty forces in Brittany, retreating before the advancing enemy spearheads and the Maquis, hastily withdrew into the coastal fortresses. This influx of troops, many of whom, demoralised and undisciplined, sought shelter from enemy bombing in the U-boat bunkers, caused such disruption to work on the boats at Brest and Lorient that the latter’s completion became doubtful. Furthermore, the army’s erroneous and pessimistic evaluation of the general situation gave the impression that Lorient could not be held for long, whereupon the Senior Officer of the local flotilla, on his own initiative, sent several U-boats to sea; and only through the intervention of the Supreme Command was some semblance of order restored, allowing work on the U-boats to proceed. On 6th August enemy spearheads had penetrated to within 20 miles of Angers, the headquarters of SO U-boats West, who was thus forced to evacuate to La Rochelle. Until the evacuation was completed on 8th, U-boat Command temporarily assumed control of operations in the Channel. This move had its compensations in that SO U-boats West was thereafter in close contact with his forces, allowing him, in the event of precipitate action by the military authorities, to take such measures on behalf of the U-boat arm as he thought fit. The ultimate concentration of U-boats in the bunkers at La Pallice, Brest and Bordeaux evoked heavy bombing by strong enemy formations between 9th and 13th August. The bunker at Bordeaux received 26 direct hits from 11,000-lb bombs, but only superficial damage was caused to the roof, which consisted of two thicknesses of reinforced concrete, one of 6.2 metres beneath a “burster course” of 3.5 metres. At Brest, the 5.6-metre roof of the bunker, which then had no “burster course”, was partially penetrated in three places by extremely heavy bombs – estimated at six tons – one of these breaches being 10 metres in diameter and the others, situated over the dividing walls, small. The U-boats in the bunker were unaffected and only slight damage was sustained by bunker equipment. Specialists from the Todt organisation, who afterwards inspected the bunker at Brest, considered that, given a 3.5-metre “burster course”, the roof would have withstood the heaviest bombs then known to exist. 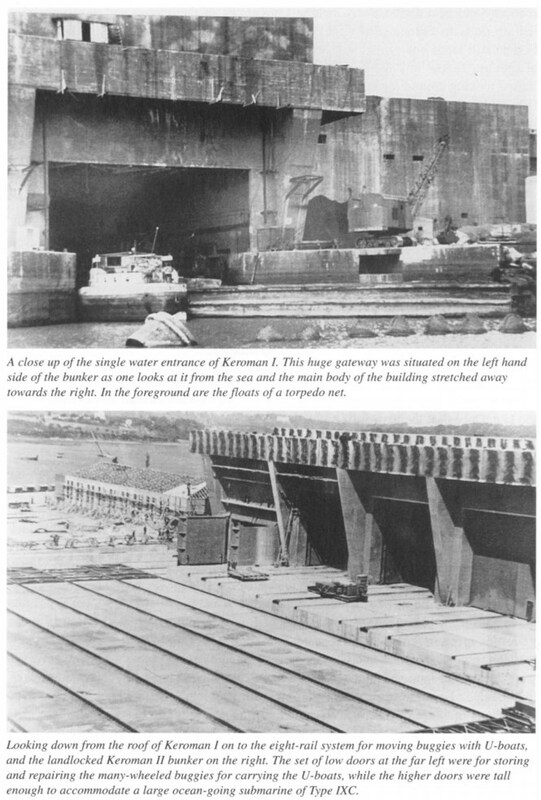 This inspection yielded valuable information, which was at once applied to the design of U-boat and dockyard bunkers currently under construction in Germany. 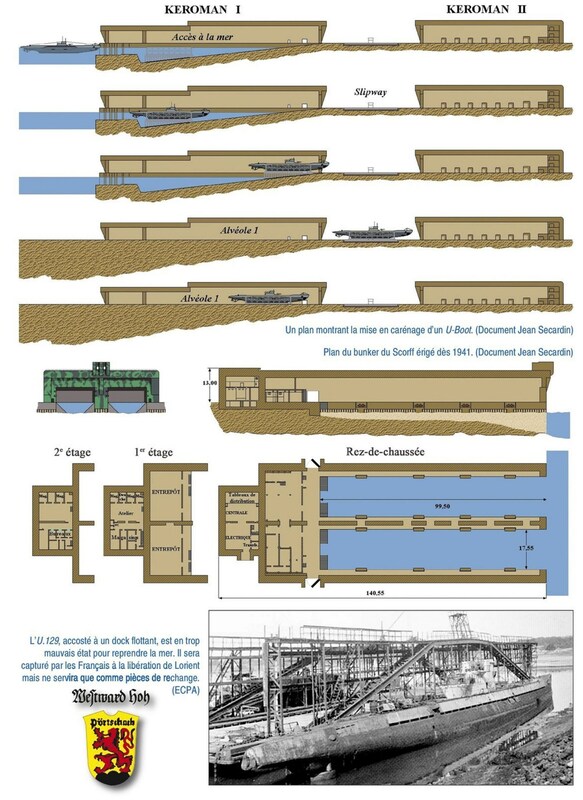 The last air attacks on the Biscay U-boat bases, in which all unprotected dockyard equipment was completely destroyed, provided conclusive proof of the vitally important role played by the U-boat bunkers since 1941. We wondered, indeed, why in 1941 and 1942 the RAF had not attempted to disrupt their construction, for at that time neither our AA defences nor our fighter force could have offered effective resistance to concentrated attacks. Continuous raids on the then unprotected bases would have so impeded U-boat repair work that, by the end of 1942, the U-boat campaign would have been rendered ineffective. When the U-boat crews returned from patrol to their moorings in Kiel, Hamburg, Bremen, Heligoland or Wilheshaven they were hailed heroes of the sea, where family and loved ones greeted the men with flowers. The U-boats were either temporarily moored in the harbor or sailed directly into the heavily protected bunker pens where the vessel could be rearmed, refueled, resupplied and serviced to fight another day. These U-boat pens were not just a staging post, which the allies had initially thought; they were in fact a lifeline to the submarine crews. Massively protected they contained all the necessary facilities – main service, fuel stores, dry docks, workshops and accommodation. By 1941 a number of U-boat pens had been constructed in northern Germany, Norway, and along the Atlantic and Mediterranean coast in France. The pens enabled the Germans to use U-boats to patrol the wide open expanses of the Baltic, North Sea, Atlantic and the Mediterranean using the new ports as base. In order to protect the U-boat bases from aerial attack a massive construction programme had been undertaken at incredible cost in labour and material. Along the western coast of France alone there had been five ports designated for the use of U-Boats, all with their own massively protected concrete pens. These were Brest, St Nazaire, La Pallice and Bordeaux. The facilities of these five U-boat bases were placed into three categories: non-tidal, tidal and onshore. The non-tidal were built on ordinary harbour basins, with a lock leading to the open sea, as at Brest and two pens at Lorient. The average size and thickness of the U-bunker walls were between 8 and 11 feet thick, and the walls between the pens varied considerably in thickness from 3 to 5 feet within the same building. The roof too was heavily reinforced and provided ample protection for the exterior walls and the entrances to the pens against direct hits or misses. For the U-boat crews that returned from patrol, hailed heroes of the sea, they sailed into these heavily protected bunker pens for a much needed respite, whilst their U-boat was rearmed, refueled, resupplied and serviced to fight another day. As these weary crewmen stepped ashore beneath the towering ceiling, which continuously dripped condensation, they were met by the familiar sounds and smells of organized activity. Passing busy teams of workers, welding, grinding, operating cranes and carrying various supplies and other important equipment, the U-boat commander was greeted with salutes. Here in port the captain and his crew would remain for more than a week whilst the men recuperated and the U-boat was resupplied. By the summer of 1941 the length of periods spent in port gradually increased and this meant that the men received travel warrants for home leave. Some of the crew, however, remained in the port and were often accommodated in a variety of local hostels. It was very rare that any of the men slept onboard their U-boat whilst it was in port. Life for the U-boatman in port was often good and this included the standard of hotels and hostels in which they were accommodated. Food and alcohol was usually abundant, and a number of men frequently visited the local brothels. Although the men looked upon the ports as a place of recuperation and a safehaven, by 1942 the RAF and the USAAF began making a number of attacks on the ports and this included the U-boat bunkers. Fortunately for the Germans the bombs seldom hit the bunkers. When they did hit, they barely scratched their surface. It seemed the bunker roofs were quite impervious to any bomb. Even the largest 12,000Ib high capacity blast bomb, and the heavy 2,000 pounder armour piercing bomb, made it useless against the reinforced concrete of the U-bunker. The flying Fortress and Liberators of the US Eighth Army Air Force bombed with more precision, but even their bombs simply bounced off the bunkers. With the realization now looming that the Allied bombs could not penetrate the massive thickness of the U-bunkers roofs and walls, the Allies decided to heavily bomb the ports and coastal towns. 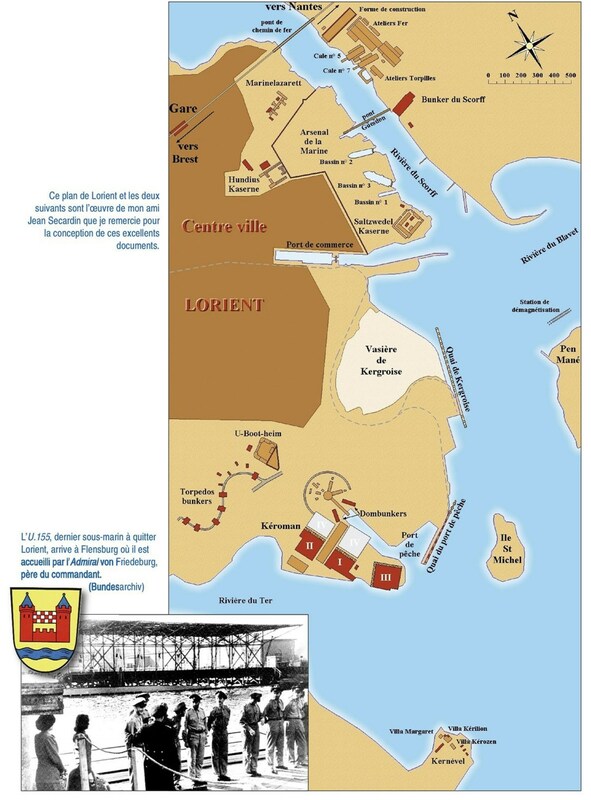 Between 14 January and 17 February 1943, the RAF and the US Army Air Force attacked Lorient and bombed most of the town. When U-boat crews returned to their home port, very little was left standing. Admiral Donitz remarked of the complete destruction of Saint-Nazaire and Lorient, ‘not a dog is left in these towns. Nothing remains – but the U-boat bunkers’. Although the Allied bombers had a left a wasteland of destruction attempting to smash the U-boat shelters, in the course of the attacks more than a hundred bombers were shot down by Luftwaffe fighters and the dozens of 8.8cm flak guns defending the bases. Many now believed that the submarine pens were too hard, or even impossible to destroy. As further attacks continued in vain, back in London Barnes Wallis, who had already achieved noticeable success with breaching of the Ruhr Dams with his bouncing bombs, designed and produced a scaled down version of a massive bomb weighing 12,030 Ib, nicknamed the ‘Tallboy’. This bomb designed for demolishing massive structures was now the only answer of destroying the U-bunkers. On 5 August 1944, the first of three waves of RAF attacks using Wallis’s new 12,000 Ib ‘Tallboy’ bombs was used against the U-bunker base at Brest. Five direct hits were achieved. A week later another raid scored three direct hits, and in the last raid on 13 August the bomber crews achieved one direct hit and two near misses. Though the Allies failed in their mission to destroy the U-boat bunkers from the air, after the Allied breakout in Normandy, the US VIII Corps had the task of capturing the Brest port and its huge naval base by systematic ground and aerial attack. On 21 August 1944, the Americans launched a massive assault against the town’s strong defences. The remaining U-boats that had been sheltering hastily left and the 9. U-Flotilla was disbanded. The last U-boat to limp out of Brest was U-256, which departed for Bergen on 3 September. Two weeks later, after a fierce long bloody battle of attrition, Brest was finally taken. With the town and harbour in ruins the Ubunker was the only structure standing almost intact. Whilst the U-boat base at Brest had been under similar attack, other U-boat ports too were under heavy attack. At Lorient the RAF launched a number of heavy bombardments against the U-boat pens and dropped almost 146 tons of bombs on its impregnable structure. Most of the dock workers had already been evacuated back to Germany or transferred by sea to Saint-Nazaire. By this period almost all the U-boats had evaded capture by leaving in early August. The last U-boat to set sail was Oberleutnant zur See Ludwig-Ferdinand von Friedeburg’s U-155 on 5 September. A month later all U-boat activity at Lorient ceased. But despite the overwhelming superiority of American troops the port held out sustaining terrible losses until 8 May 1945. Further south at Saint-Nazaire the port and its U-bunkers also had to endure air attacks and a siege. Once again German defence proved virtually impregnable. In August 1944, during some of Saint-Nazaires heaviest attacks the 6. U-Flotille was disbanded and the 7. U-Flotilla ordered to set sail immediately for Norway. Four Uboats departed at the end of August, and the last two left a couple of weeks later following major repairs. When the U-bunkers were finally captured American troops found U-510 in pen 4, docked for repair, having sailed all the way back from the Far East loaded with raw materials. At La Pallice the U-boat complex there also put up stiff resistance against air and ground assault. With its string of anti-aircraft guns and well prepared defences ‘Fortress La Rochelle’ battled mercilessly to keep the town and its U-bunkers from being captured. As further attacks intensified 3. U-Flotilla hurriedly departed for Norway, finally ending the short chapter for U-boats at La Pallice. In the south of France the last of the U-bunkers at Bordeaux came under attack by the RAF. In August 1944 at least 400 tons of bombs alone were dropped on the U-base including attacks on oil storage. Despite the complex being heavily defended the 12. U-Flotilla was finally disbanded. In the dying days before it fell 500 German soldiers held the base to enable engineers to destroy the installation. Taking the name of the long narrow island on which it stood, the Pharos of Alexandria was the most famous lighthouse of antiquity. Situated on a high mound at the end of a long peninsula, 3 miles (5 kilometers) from the city, it was a technological marvel and formed the prototype of the modern lighthouse. Since the sixth century a.d. (when it replaced the walls of Babylon) it has been listed among the seven wonders of the ancient world. In 323 b.c. Alexander the Great died in Babylon, leaving no heir. Forty years of conflict followed as his generals fought for control of the vast Macedonian Empire. By 280 b.c. three major dynasties emerged: the Seleucids in Asia, Asia Minor, and Palestine; the Antigonids in Macedonia and Greece; and the Ptolemies in Egypt, the wealthiest and most enduring of all, who would reach their peak under Ptolemy II Philadelphos (reigned 285–246 b.c.). His capital was the grand city of Alexandria, designed by Dinocrates, personal architect to Alexander. 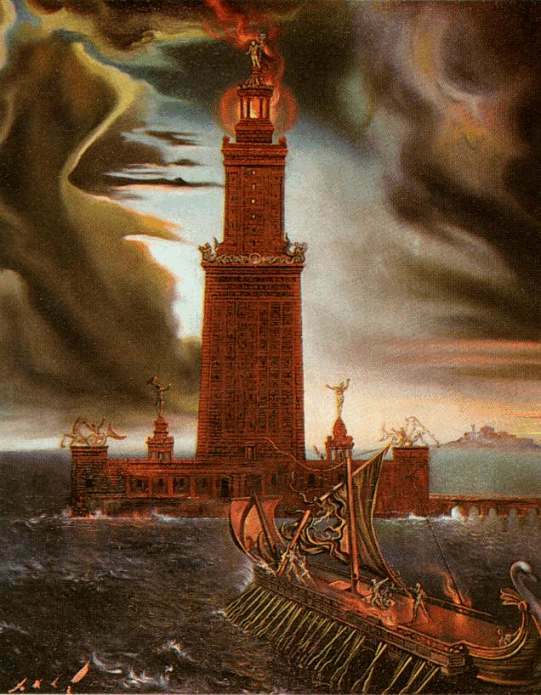 Around 290 b.c., because of the dangerous sandbanks in the approaches to Alexandria’s harbor, Ptolemy I Soter initiated plans for a lighthouse. The work was incomplete when he died five years later. In 281 his son Ptolemy II Philadelphos commissioned the engineer Sostratus of Cnidus to build a great lighthouse on the eastern point of the island of Pharos, reached across a causeway named the Heptastadion. There is a tradition that structural and other calculations were made at the famous Alexandrian library. Hellenistic accounts like those of Strabo and Pliny the Elder describe a tower faced with glistening white marble, crowned with a bronze mirror whose reflection of the sun could be seen 35 miles (56 kilometers) off shore. Apocryphal accounts claim the mirror was also a secret weapon used to burn enemy ships at sea. Indeed, most descriptions are sketchy, and popular images of the Pharos have been based on an interpretation of coins, terra-cottas, and mosaics published by Herman Thiersch in 1909. The most detailed description of the Pharos was made in 1166 by the Arab traveler Abou-Haggag Al-Andaloussi (to whom Thiersch did not have access), portraying a structure composed of three battered tiers: the lowest was square, 183 feet (56 meters) high, with a cylindrical core; the middle was a 90-foot-high (27.5-meter) octagon with a side length of 60 feet (18.3 meters); and the third was a cylinder 24 feet (7.3 meters) in height. There are few accounts of the interior of the great tower, except to say that it had many rooms and corridors. Fuel for the nightly bonfire was mechanically lifted through an internal shaft. The fire could be seen for about 100 miles (160 kilometers). The Pharos served the mariners of the Mediterranean for about 1,500 years. In a.d. 642, the Arabs conquered Egypt and moved their capital to Cairo. In 796 the upper story of the lighthouse collapsed. Later, Sultan Ibn Touloun (reigned 868–884) built a mosque on the partly ruined tower. In the middle of the tenth century, an earthquake shook Alexandria and caused another 72 feet (22 meters) of masonry to fall. Despite frequent and sometimes extensive repairs being undertaken by the Arabs, earthquakes continued to have a cumulative effect: no fewer than twenty between 1303 and 1323 meant that the Pharos finally toppled some time before 1349. By then Al-Malik-an-Nasir had begun to build a similar lighthouse beside it but the project was halted at his death. Around 1480 the Egyptian Mameluke Sultan Qait Bey built a fortress over its ruins, using its stones for walls. In the early 1990s the Egyptian government began building a breakwater to protect the fortress from storms. The project was postponed while archeologists from the Egyptian Supreme Council of Antiquities and the French Centre d’Études Alexandrines searched the harbor. Since 1996 they have found over 2,000 objects, columns, capitals, thirty sphinxes, and—most significantly—two colossal statues (one of Ptolemy I and another of a female torso) scattered over more than 5 acres (2 hectares) of the seabed near Alexandria. It is believed that the finds include the ruins of the fabled Pharos. In September 1998 the U.S.$70 million Alexandria 21st Century Project was announced by the Fondation Internationale Pierre Cardin, claiming the support of UNESCO and proposing to build a 475-foot-high (145-meter) glass-covered concrete lighthouse on the site of the original Pharos. Happily, it came to very little. Clayton, Peter, and Martin Price. 1988. The Seven Wonders of the Ancient World. London: Routledge. Cox, Reg, and Neil Morris. 1996. The Seven Wonders of the Ancient World. Parsippany, NJ: Silver Burdett. Sly, Dorothy I. 1996. Philo’s Alexandria. London: Routledge.